A durable, machine washable, white cotton onesie with a colorful logo and an inspiring message in English or Spanish. Color choices are pink or blue. Sizes include: small, medium, large and extra large. If you are looking for a gift that is special, a unique idea, and meaningful this is it! This is a great baby shower, newborn gift, birthday gift, Christmas gift, twin gift, baptism gift, etc. 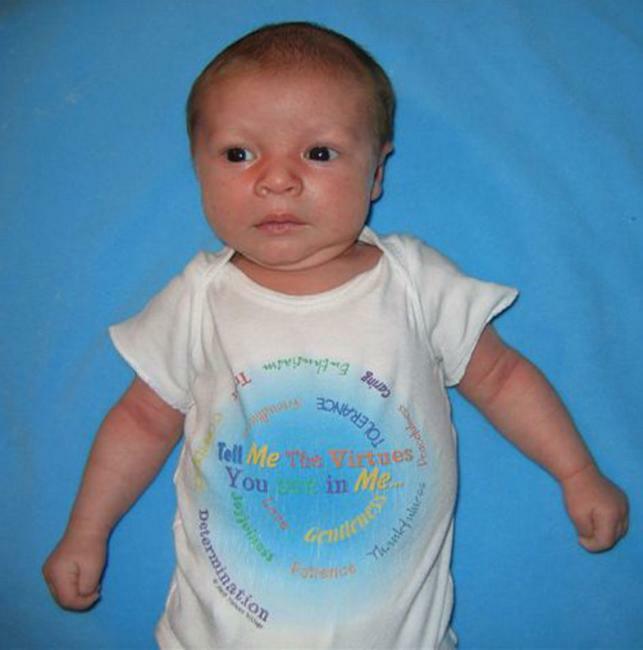 The message on this onesie, "Tell Me The Virtues You See In Me" is a gentle reminder for parents to look for virtues in their children. Babies are born with all the virtues in potential. It is the parents who first nurture the growth of these virtues. Just as the acorn has potential to become a mighty oak tree, when you see a virtue, name it and say how you see it, you help it grow. Attached gift tag repeats this message. The spiral of words from the middle to the outside include: love, gentleness, tolerance, friendliness, joyfulness, patience, thankfulness, peacefulness, caring, enthusiasm, trust, confidence, determination. They come in short and long sleeve.